Until racism raises it’s ugly, violent head again. And just when you thought we’d put all of this behind us, humanity’s worst fault line has threatened to split society’s festering wound again. We have been more circumspect in Canada. The country that was the destination of the Underground Railroad is not without succumbing to its own form of racism. If you are black, or any shade of brown, then the chances are that you have felt this insidious discomfort for your being different at the core of many relationships. We have pretended for far too long. Black Lives Matter. The sooner we accept this we will be able to accept that all lives matter. But you can’t pretend it does not exist. You cannot ignore the pain of the Black community, its people… Not if artists like Toronto bassist and composer Rich Brown lives in your neighbourhood. Brown is not only a wonderful bassist and composer, but a sensitive artist, who by his own admission has been at the receiving end of the darkest of human frailties. And now he has turned the experience of it, the anger and and his indomitable spirit into a work of significant import – his 2016 album Abeng. The record opens with the sounding of the abeng, traditionally a horn used by the Maroons of Jamaica to call the community to gather together. Rich Brown uses its sound, mimicked by the (alto) saxophone to whip up the music of the record. What follows are a series of dark songs that reflect the mood of the bassist much like the persona of the painter of Guernica. In this repertoire we hear the voices of Mingus, Roach, Coltrane, Sanders and Ayler – the whole jazz continuum – railing against the nature of society to discriminate along racial lines. However, this is not a polemical work. Its music features tough melodies, ensconced in growling rhythms, the sound and fury of which remind us that something terrible has happened. Emotions peak in Chant of the Exiled (Abeng) which music is a reflection of Brown’s pain and anger. It is an inspired piece of programme planning, with an account of Brown’s experience that plumbs the depths of melancholy, setting off a radiant life-affirming performance here as well in the rest of the repertoire. 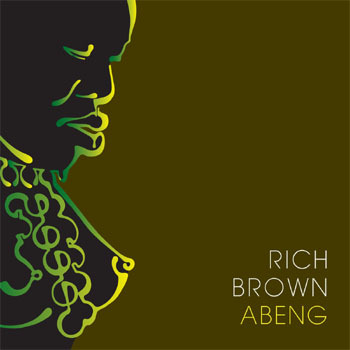 Rich Brown, together with the stellar musicians that he has gathered around him, succeeds brilliantly; one feels, in this and other places, that such precision actually helps him to convey the intensity of feeling that lies behind this music that has been dedicated to the Black community. Brown stylish way with the rumbling rhythms together and the uplifting saxophones brings a suggestion of victory that renders more poignant the effect of the dark, complex harmony – a bright outcome rendered from a sad and bitter memory. The record is not without its intellectual matter. Achilles & the Tortoise recalls and is based on the famous dialogues between the characters of Douglas R. Hofstadter in his book Gödel, Escher, Bach: an Eternal Golden Braid. This classic conundrum of the intellect brings to a close, a disturbing, but ultimately edifying album, by ending it on a very high note. Track List: Mahishmatish; Window Seat; Chant of the Exiled (Abeng); Promessa; This Lotus Ascension; The Etymology of Ouch; Parity of Esteem (An Illustration of Imbalance); Achilles & the Tortoise. Personnel: Rich Brown: electric bass, clavé (4); Luis Deniz: alto saxophone; Kevin Turcotte: trumpet (3, 6); Kelly Jefferson: tenor saxophone (1); Chris Donnelly: piano (1, 6, 7, 8); Robi Botos: piano (2, 3, 4, 5), Fender Rhodes (2); Larnell Lewis: drums; Rosendo Chendy Leon: percussion (3).